This is an example how to interface to the standard Hitachi-44780 LCD using an 8051 microcontroller and SDCC as C Compiler. I use a standard 16-character by 2-line LCD module, see schematic below. Here, I use 4-bit interfacing. 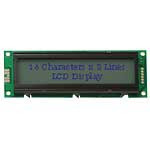 You can find lcd interfacing tutorial using Proview32 on this website www.lcdinterfacing.infohttp://www.lcdinterfacing.info.